No matter you are riding in group or riding along. Jimmy is your best friend and will be with you wherever you go. Jimmy is designed to run on 27.5” rims and wider tires which produce the same outer diameter as a typical 700x28c. This means Jimmy can run bigger knobby mountain bike tires which have all the grip but still retain the same geometry of a gravel bike. The MKT double & triple-butted tubing has the perfect balance of weight and durability. The frame is designed with drive-side yoke to allow tire clearance up to 27.5x2.4 or 700x45c tire. Extra triple cages mount under down tube, and top tube ‘fuel’ bag mounts allow various loading options. Stealth dropper post routing is included. STEEL RULE SUPPLY investment casting dropout is working with both quick release & 12mm thru axle systems. VELOCI No.11 flat mount 12mm thru axle carbon fork features with ideal triple cages mounts on both side to allow the installation of anything cages. 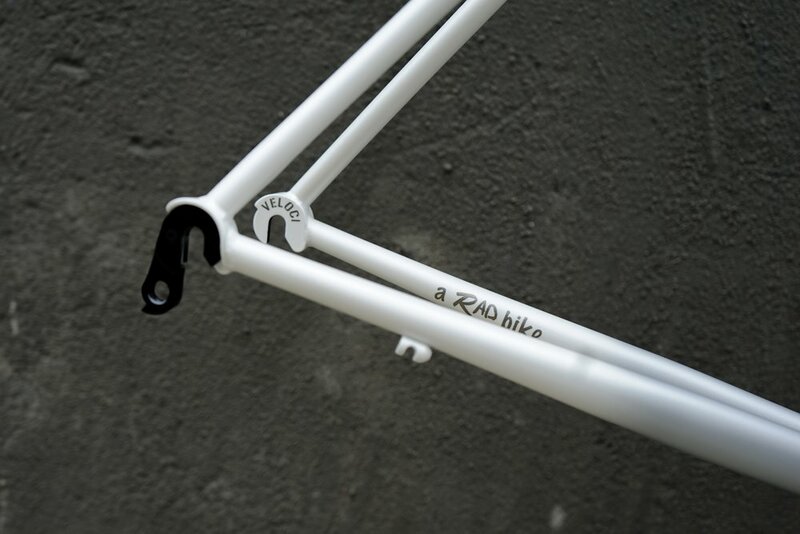 No need to mention about rack & fender mounts are included on both frame and fork. Your best friend, Jimmy, will be with you wherever you go. Except building our RoAD 2.0 frame with well-known Columbus tubes, Veloci design team decide to write more about our technical details beneath the paint which give our bikes signature look and great riding quality. Our head tube is fully machined from very light material which is thinner at main body and reinforced at the ends to distribute stress from the rider and the road. These reinforced ends taper out to just the right diameter to meet the headset, making for a smooth transition front top Top & Down tube. Our top & down tube is bio-ovalized, which is vertically ovalized at the headtube to deal with the force transmitted from the road, and provide better vertical stiffness when you are standing up and hammering. And it is then ovalized horizontally at the bottom bracket to adding more horizontal stiffness and balance to transfer your pedaling power flawlessly to the rear wheel. These shapes also allow us to build our frames with thinner and lighter tubes which provide a more lively ride. horizontal stiffness and balance to transfer your pedaling power flawlessly to the rear wheel. These shapes also allow us to build our frames with thinner and lighter tubes which provide a more lively ride. 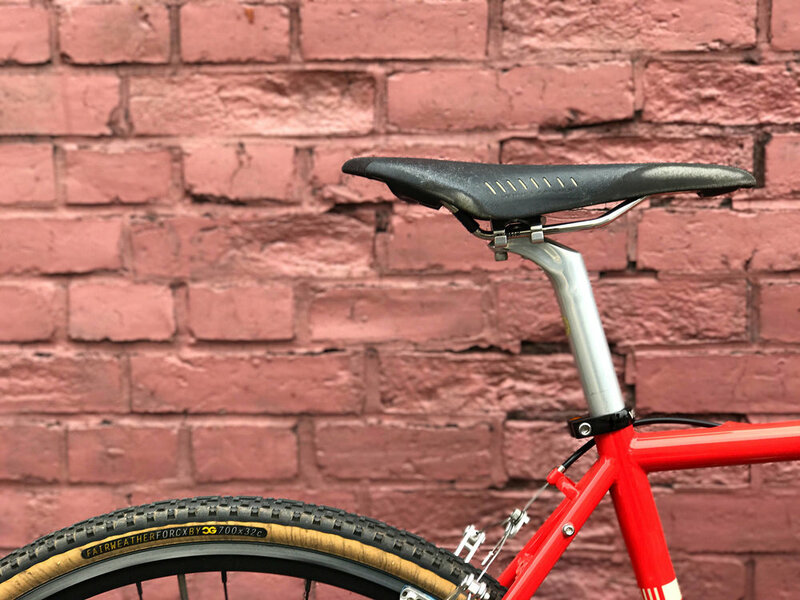 Our parallelogram seat lug provides wider horizontal bed in the front for ovalized top tube junction and lower bed in the rear to allow seat stays to be welded lower for better rear triangle stiffness. Seat stays plays important roles in riding comfort. Our curved seat stays helps soak up vibrations transferred from rear wheel, and remaining vibrations can be distributed by our seat lug and only left much less going through to your saddle. creating better lower triangle stiffness. And then chainstays are welded to a well-proven Wright-style dropout to transfer your pedaling power flawlessly. The combination of all the details makes our RoAD 2.0 the best choice for those who need a bike for speed and a taste for steel. OLD STREET frame set. All the goodies are chosen for this one. coming for next year to fit PLAN Big lovers with different tastes and characters. ride one for yourself and feel the greatness of a steel road bike can be. Really thanks for the interview from BIKERUMOR during Taipei Cycle show 2017. The two bikes they interested most is our GRAVEL bike DISKO and 26” TOURING Bike PLAN Big. The following links are the full interview from BIKERUMOR and introductions of DISKO and PLAN Big. We love selling complete bikes because it’s the fastest way for our clients to taste and enjoy our bikes. But we also love to see more customizations so we can see all the different potential on our bikes. Jeff chooses cool gray DISKO as his first gravel bike. He purchased most black components to pop up the DISKO paint schemes, such as Zipp Aero Bar, Sram Rival 1 with black cassette, TRP Sprye, ROLLCii REX DB and MAXXIS RAZE cross tire. We particularly loved the use of “ Destroyed Finish” Thomson stem matched with black camo Lizard bar tap. BROOKS CAMBIUM B13 and TUNE Wurger are also the best touch. The result is a true aggressive and ready-to- go-everywhere gravel machine. We love riders's creations. A great customized-built bike always grabs our attention, especially special one like this bike. Our friend wanted a flat bar commuting & cross bike particular for his daily riding base. He started with a tangerine EVERYMILE A+frame set, and choose not to buy any super pricy group set on this bike this time, so he pulled off his SHIMANO XT 9speed from his old mountain bike and collected White Industries NEO crankset and Paul Chain Keeper & Microshift Thumbie to build his unique 1x9 speed drivetrain. The bike is finally juiced up with Ritchey cockpits, Paul Canti Lever and Velo Orange Grand Cru Zeste cantilever brakes. Believe me, 9 speed is not totally dead yet and still quite enough for most riding occasions. Thanks our friend to share images with us and PINECONE WORKS for their professional mechanical support. The above image shows how our frame & fork look before painting. All our frame & fork are placed in a bath where an electric charge is applied. This process is called Electrophoretic Deposition and creates a thin layer of black satin coating to the tubes inside and out. This coating has been proven to be one of the best way to protect your frame & fork against rust. VELOCI is lucky to have our engineering base in Taiwan. Therefore, we can work very closely with component makers, frame builders and even tubing suppliers. Combining the advantage we have and considering there is no secret that some Columbus & Reynolds tubes are outsourced to Taiwan already. So we decide to do something on our own. We decide to build our frame with our own customized tubes after several years working with our tubing suppliers and tubing add-on processing plant. What is MKT tubing? In short, it’s custom, extruded & heat-treated tubing. Custom tubing allows us to use the thinnest walls practical while maintaining same strength and weight targets. Rather than just accepting the standard offering from tube supplier, MKT gives our engineer team the opportunity to design our bike with customized butting profile and wall diameters. Good & creative ideas are not limited by accepting standard tube. What is more surprising is not only front triangle can be customized, but stays as well. Yes, full customization. For example, how custom? On the forthcoming gravel disc bike we are about to offer. We can customize asymmetric butting on toptube and downtube at the headtube junction. We increase the wall thickness at the top of toptube and bottom of downtube to create a similar effect of adding external headtube gussets. This allows us to build a frame stronger, lighter and better-looking. This customization advantage allows us to improve riding quality of our line and differentiate our bikes from the rest in the market. We plan to expand our MKT tubing to more models, but not all of them. Because in some cases, standard tubes just perfectly fits our need. When we want to go deeper in one project. You will see MKT tubing marks on our frame.